Yesterday, the carpet installers came to the church facility to lay the carpet on the stage. There’s still one piece to be laid, covering our baptistry, but there is a remarkable difference between what it looked like before and what it looks like now. It is amazing how much a couple of steps and new carpet can transform a space. 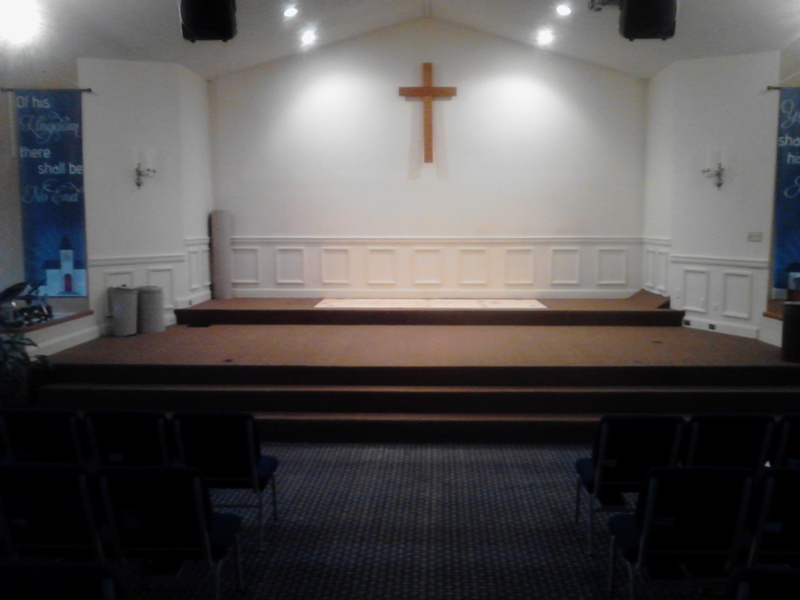 Over the past two years, we have made a lot of mostly superficial changes to our worship space. There has been a lot of repainting and refacing but this is the first major structural change we have made (unless you include replacing windows). It took me years to realize that one of the weirder things about being called into leadership is that you see what God is going to do before it happens. I don’t mean this in like some kind of weird dream-in-the-night kind of thing. It is more like when you’re playing chess and you can see the next three or four moves in your head. It is not quite like that, but it is as close as I can get. When I walk through our facility, I see both how it is and how it will be. I saw this stage whenever I looked at the stage as it was. Can’t explain it. I just did. It is not hard to see how leaders can become deluded that this vision of the future is something intrinsic to their own existence. Leaders develop gigantic egos because they can see things and then make them happen. This happened with King Nebuchadnezzar in the book of Daniel (Daniel 4:29). He mistakenly believed that the reality of his success was his own doing, but YHWH taught him differently. It is also easy to see how a leader can stress out beyond all human tolerances because he sees something that he cannot seem to accomplish. I know a lot of pastors who are desperately stuck bouncing back and forth between what God wants to do and the reality of where they are. Their academic training says that if they just work hard enough and research the right resources they will be able to get a good grade. But ministry is not an academic exercise. The amount of your effort is in no way proportional to the results. How do you bring reality up to vision? This sounds naive, but you have to trust Jesus to make it happen. God is at work in the hearts and minds of the people in your congregation, pastors. What Jesus is trying to do through you is the same thing he is trying to do in their hearts and minds as well. If you truly believe it is God’s thing, then cast it before your fellow leaders. Put it in front of the people of your congregation, but don’t put it there with a, “I have seen this and you must make it so!” attitude. Lay it out as what Jesus wants to do. Explain carefully and repeatedly (oy! will you need to repeat it) so that people can take this vision for their own. This takes time. Reality does not align with vision immediately. Often, it takes quite a bit of adjustment and inquiry before people see the same thing you do. They have to try different ways to see it before they really see it. When the veil is finally lifted and they grasp Jesus’ vision, great things will happen. Don’t delude yourself and you will be spared both the sins of arrogance and anxiety.